The Neon Remote Terminal (NRT) combines a data logger with either a duplex cellular or satellite transceiver. The NRT is designed to automate collection of remote data from environmental monitoring, industrial measurement, and utility metering sites. It connects to sensors in the field, collects readings from the sensors, and transmits the collected data to a central server. Fully bidirectional communication is possible via the Neon server - data can be collected directly, and the NRT programmed, from any internet connection on the globe. 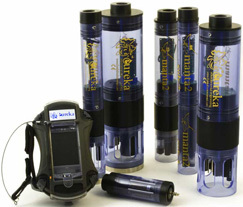 Engineered to last for years in the field, the Eureka Manta Multiparameter Water Quality Sonde is ideal for fresh, salt or brackish water monitoring applications. Housed in a tough 3.25" diameter PVC housing, the Manta has 1.5 MB of EEPROM memory and can accommodate water quality sensors for temperature, conductivity, dissolved oxygen, pH, ORP, turbidity & depth/stage. For spot checks, the Manta can be connected to the Amphibian Field Display Unit, or for long term remote monitoring applications, an optional 8 D cell battery pack can be installed. The 495 Recorder is functionally equivalent to the Analite 395 turbidity probe, but includes a temperature sensor and flexible data logger, packaged in a self-contained stainless steel cylinder that is easy to set up and download via the RS-232 PC interface. 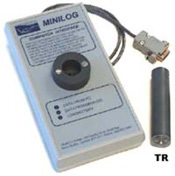 This microprocessor based turbidity logger is designed for monitoring and logging applications where turbidity levels of up to 1,000NTU may be encountered. To maximize resolution, user selectable ranges of 40NTU, 100NTU, 400NTU and 1000NTU are available. 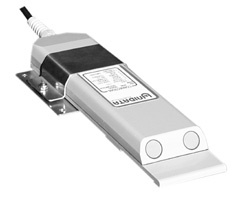 The 495 uses nephelometric 90 degree optical retro-scatter technology to ISO-7027 specifications. A newly implemented differential measurement technique with sample and hold provides enhanced performance at low turbidity levels, and extremely low zero drift. The sensor uses a unique modulation technique that ensures almost total rejection of ambient light, and the integral wiper assembly keeps the lens clear of sedimentation build-up and bio-fouling. 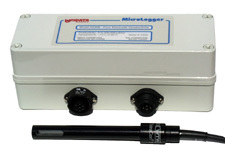 The LTC Levelogger Junior logs conductivity, as well as water level and temperature. Like the Levelogger Gold and Junior, it is easy to transport, program, deploy and retrieve data. It combines a datalogger, 5-year battery, pressure transducer, and temperature and conductivity sensors within a small stainless steel waterproof housing, 22 mm x 190 mm. The conductivity sensor is a 4-electrode platinum sensor, with auto-ranging capabilities. 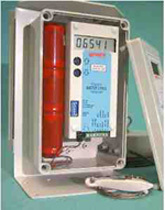 Using standard Levelogger Software, it displays conductivity, temperature, and temperature-compensated water level. Memory is non-volatile and stores up to 16,000 sets of readings. Measurements are linear, in any interval between 5 seconds and 99 hours. The 6536 Water Conductivity Recorder is a complete measurement system suitable for permanent field installation. Graphite electrodes, combined with zero potential measurement technique, maximize stability and reduce effects due to algae growth and other water pollutants. Three built-in ranges allow the one instrument to cover a wide range of conductivities. Autoranging means the instrument works at its optimum resolution throughout the operating range. This enables monitoring of saline conditions while still accurately measuring flushes of fresh water. The WaterMonitor is a submersible hydrostatic level transducer with embedded datalogging offering the highest level of functionality and accuracy available today. The transducer meets the demanding requirements of the USGS Office of Surface Water (OSW) accuracy specification for stage monitoring. 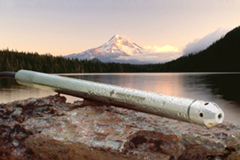 The New Levelogger Gold represents the next generation of discrete water level & temperature dataloggers. With no vented cable, the sealed design combines a datalogger, built-in lithium battery, pressure transducer and temperature sensor, in a small, minimal maintenance, 7/8" x 6" (22 mm x 154 mm) stainless steel housing. It can be suspended on a simple wire line, or connected to the surface with a direct read cable (for downloading of data and/or reprogramming without removal from the water). The Levelogger Junior is the newest addition to the Solinst Levelogger Family. The Levelogger Junior provides an inexpensive alternative for measuring groundwater and surface water levels. It combines a data logger, temperature sensor, pressure transducer, and 5-year battery, in a small, maintenance free, waterproof stainless steel housing. The Levelogger Junior features a non-volatile memory, with a capacity of 32,000 sets of temperature and water level data points. Readings are linear at a user-defined interval between 0.5 seconds to 99 hours. Accuracy is 0.1% FS, with a lifetime factory calibration. The Minilog is a rugged miniature temperature and depth logger that stores more than 8000 readings in nonvolatile memory. The temperature and optional depth transducer are mounted in one end of the Minilog, while an infrared LED transistor, used to transfer data from the Minilog to the PC interface, is mounted in the other end. The infrared LED transistor eliminates the need for expensive and unreliable waterproof connectors, and indicates the Minilogs' operational status to the user. The Starflow is a compact, easy to use system for measuring the velocity and depth of water in rivers and streams, open drainage channels and large pipes.